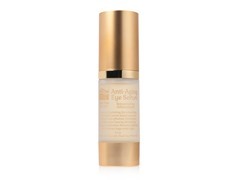 Intensely hydrating, fast absorbing, lightweight serum leaves eye area soothed and refreshed. Diminishes wrinkles, fine lines by stimulating collagen production. Prevents puffiness and reduces bags under eyes. Dead Sea Anti-Aging Peeling Gel is a great Dead Sea facial product to help in cleansing your skin. Clean skin is essential for beautiful skin. Dead Sea Spa Care Anti-Aging Peeling Gel is specially formulated with a gentle blend of rejuvenating and anti-aging Dead Sea Minerals and beneficial properties of the Dead Sea which allow for fresh and radiant skin to emerge, while dead skin cells are removed. This gentle-action Dead Sea Anti-Aging Peeling Gel removes dead cells, which inhibit the natural process of cell renewal, leaving skin clean and glowing. This Dead Sea Anti-Aging Peeling Gel is a mild exfoliante stimulates cell activity and prepares the beautiful skin to receive nourishing moisturizers. A single treatment of the Dead Sea Anti-Aging Peeling Gel clears away dead cells, unclogs pores and leaves beautiful skin looking radiant and smoother. Dead Sea Spa Care Anti-Aging Peeling Gel is made in Israel and is offered in a 3 oz jar. Here is the Cleansing Milk, natural facial cleanser product you were looking for. Healthy and effective skin care must begin with clean skin, natural skin. Dead Sea Spa Care offers simple steps to proper facial cleansing first thing in the morning and before going to bed. The Dead Sea Spa Care Cleansing Milk cleanses the facial skin of oils produced during the night, removes makeup, dirt and impurities collected during the day, while nourishing it with wonderful minerals from the Dead Sea, which are essential for the metabolism of the skin. Minerals found in the Dead Sea Cleansing Milk facial cleanser provide protection and strengthen cell membranes against dehydration and environmental hazards. Medical studies have shown that Dead Sea Minerals are effective in treating psoriasis, acne, rheumatism and eczema. Carefully cleansing the skin twice a day with this natural facial cleanser is the basis of healthy skin care. and that is why people love our Dead Sea Cleansing Milk. This soap free, Dead Sea mineral formula gently cleanses and removes eye makeup. Cleansed skin breathes freely, and that's why this beauty skin care product is so essential. The soap free facial cleanser, Dead Sea Cleansing Milk is not oily, but it softens and moisturizes the skin leaving it silky smooth, not dry while it deeply cleanses the pores. The Dead Sea Cleansing Milk is good for all skin types because it's a mild soap free facial cleanser that simply removes excess oils and debris. This Dead Sea Cleansing Milk is a wonderful way to prepare the skin for our moisturizers. The Dead Sea Spa Care Cleansing Milk is made in Israel and is offered in an 8 ounce bottle. 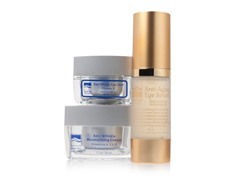 Are you looking for the best eye cream, an anti-wrinkle eye cream or Dead Sea eye cream to moisturize your eyes? Dead Sea Spa Care Anti-Wrinkle Eye Cream is specially formulated with Dead Sea Minerals, Vitamin A and Vitamin E, which are known to be powerful anti-oxidants and skin strengthening natural ingredients to nourish and moisten and protect the sensitive eye contour area against primary causes of premature skin aging. This intensive wrinkle cream for natural treatment of wrinkles and fine lines. 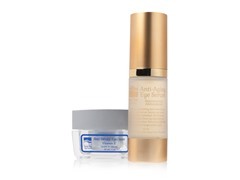 This professional anti-wrinkle eye cream keeps the very delicate skin around your eyes looking young by nourishing and revitalizing skin cells, stimulating metabolism to fight wrinkles and puffiness, and firm the skin. The gentle blend of rejuvenating minerals and beneficial properties of the Dead Sea allows for fresh and radiant skin to emerge with this Anti-Wrinkle Eye Cream. The Dead Sea Spa Care Anti-Wrinkle Eye Cream contains natural filter protection, due to the special Aloe Vera complex in the products, to help protect your skin from the effects of environmental damage. The ingredients provide UVA and UVB sun filters that protect your skin from harmful ultraviolet radiation. This Anti-Wrinkle Eye Cream is quickly absorbed into the skin leaving no shiny traces of residue making it a perfect base for makeup. 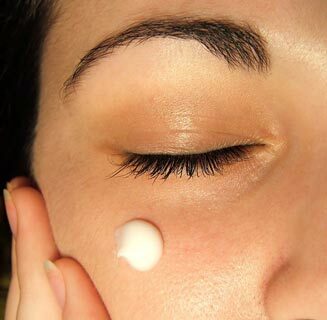 This wrinkle cream will leave your skin looking younger than ever. A little goes a long way with this nourishing formula of our Anti-Wrinkle Eye Cream to restore your skin's natural tone, reduce puffiness and revitalize your skin. The Dead Sea Spa Care Anti-Wrinkle Eye Cream is made in Israel and is offered in a 30 ml / 1 oz jar. Here is the Dead Sea Anti-Wrinkle Moisture Cream, Dead Sea moisturizer, facial moisturizer you've been looking for. Dead Sea Spa Care Anti-Wrinkle Moisture Cream is specially formulated with Dead Sea Minerals, Vitamin A & Vitamin E, which are known to be powerful anti-oxidants and skin strengthening natural ingredients to nourish and moisten your skin. This intensive anti-wrinkle cream is for natural treatment of wrinkles and fine lines. This wrinkle cream will leave your skin looking younger than ever. The gentle blend of rejuvenating minerals and beneficial properties of the Dead Sea found in this Dead Sea Anti-Wrinkle Moisture Cream allows for fresh and radiant skin to emerge. The Dead Sea Anti-Wrinkle Moisture Cream natural filter protection, due to the special Aloe Vera complex in the products, to help protect your skin from the effects of environmental damage. The ingredients provide UVA and UVB sun filters that protect your skin from harmful ultraviolet radiation. A little goes a long way with this nourishing formula in the Dead Sea Anti-Wrinkle Moisture Cream to leave your skin feeling wonderfully supple, effectively hydrated and protected all day. The Dead Sea Anti-Wrinkle Moisture Cream is made in Israel and is offered in a 50 ml / 1.7 oz jar. Clean skin, beautiful skin starts with the Dead Sea Spa Care Anti-Aging Facial Scrub Cream. Skin facial treatments all start with clean skin, and the Dead Sea Spa Care Anti-Aging Facial Scrub Cream is a light facial wash that exfoliates your skin gently with Dead Sea minerals. Especially for active people, proper facial cleansing is very important, and our Dead Sea Spa Care Anti-Aging Facial Scrub Cream is a wonderful facial scrub cream for cleansing your skin. Dead Sea Spa Care Anti-Aging Facial Scrub Cream is specially formulated with Dead Sea Minerals, Shea Butter and Vitamin E, which are known to be powerful anti-oxidants and skin strengthening natural ingredients to nourish and moisten your skin facial treatments. This Dead Sea facial cleansing product contains mild granules that gently exfoliate the facial skin clean of dead skin cells, dirt and oil, while leaving the skin moisturized and smooth after this facial treatments. The gentle blend of rejuvenating Dead Sea minerals and beneficial properties of the Dead Sea allows for fresh and radiant beautiful skin to emerge. Order your facial wash Dead Sea skin facial treatment products for clean skin, beautiful skin today! The Dead Sea Spa Care Anti-Aging Facial Scrub Cream is made in Israel and is offered in a 50 ml / 1.7 oz jar.